Welcome and thank you for choosing Next Level Gymnastics Academy! At NLGA, we offer the best technical skill training for athletes and only want to help your child accomplish their dream. Your child will learn what it takes to become a hard-working athlete, while experiencing the love and support that comes along with it. Please call us at 803-327-3547 or email us at nextlevelgymnasticsacademy@gmail.com if you have any questions during this process! By signing this release form, I consent to my child(s) for each and every use by Next Level Gymnastics Academy, and all of its employees to each photograph, videotape or other likeness of my child or myself taken. Such use may include, but not limited to, every use in a publication, newspaper, advertisement, website, videotape presentation, television show, Facebook or other publication or recording. I also waive any right to compensation for such uses, or to inspect or approve the uses beforehand. I release Next Level Gymnastics Academy, its legal representatives and all persons acting under its permission or authority, from any liability for any blurring, distortion, alteration or optical illusion that may occur with these pictures. We, at Next Level Gymnastics Academy feel there are certain qualifications and standards that are necessary to ensure a safe, secure and satisfying gymnastics environment in our facility. 1. 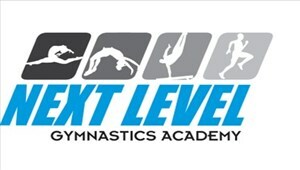 Only members of Next Level Gymnastics Academy are allowed on the floor or any equipment. 2. No one may go on the floor or any equipment at any time without an instructor present. 3. NO use of equipment before or after class. 4. NO jumping on trampoline without an Instructor present. 6. NO new skills may be attempted without an instructor's permission. 7. Parents, as well as non-participating siblings, friends, etc., are not allowed in gym area. Please watch from the lobby. Nonparticipating children need to be sitting with parents or playing quietly in the "Lobby Area." Parents are responsible for any children making use of this area including keeping the lobby clean. 8. Be aware of others in the gym. Do not walk across tumbling paths, vaulting paths, or dismount areas without looking first. 9. Enter and leave gym area through the lobby area only; do not use side doors. 10. Girls are required to wear gymnastics (not a dance leotard) leotards. 11. Boys are required to wear t-shirt and comfortable shorts. 12. Hair needs to be up and out of your face at all times. 13. NO jewelry may be worn. 14. NO food, gum, candy, or drinks are permitted in the gym areas. 1. I understand and acknowledge that the activity my child is about to engage in poses known risks and unanticipated risks which could result in death, injury, paralysis, emotional distress, or damage to my child, to property, or to third parties. The following describes some, but not all, of those risks: Gymnastics entails certain risks that simply cannot be eliminated without jeopardizing the essential qualities of the activity. Without a certain degree of risk, gymnastics students would not improve their skills, and the enjoyment of the sport would be diminished. Gymnastics exposes its participants to the usual risk of cuts and bruises. Other more serious risks exist as well. Participants often fall off equipment and sprain wrists and ankles. They can also suffer more serious injuries as well. Traveling to and from shows, meets and exhibitions raises the possibility of any manner of transportation accidents. In any event, if your child is injured, your child may require medical assistance at your expense. 3. I hereby voluntarily release, forever discharge and agree to hold harmless and indemnify NLGA from any and all liability, claims, demands, actions or rights of action, which are related to arise out of, or are in any way connected with my child's participation in this activity. 4. Should NLGA, or anyone acting on their behalf, be required to incur attorney's fees and costs to enforce this agreement, I agree to indemnify and reimburse them for such fees and costs. 5. I certify that my child has health, accident and liability insurance to cover any bodily injury or property damage that may be caused or suffered while participation in this event or activity, or else I agree to bear the costs of such injury or damage to my child. I further certify that I am willing to assume the risk of any medical or physical condition my child may have or else I am willing to assume and bear the costs of all risks that may be created, directly or indirectly, by any such condition. 6. In the event that I file a lawsuit against NLGA, I agree to do so solely in the state of South Carolina, and I further agree that the substantive law of that state shall apply in that action without regard to the conflict of law rules of that state. I agree that if any portion of this agreement is found to be void or unenforceable, the remaining portion shall remain in full force and effect. By signing this document, I acknowledge that if anyone is hurt or property is damaged during my participation in this activity, I may be found by a court of law to have waived my right to maintain a lawsuit against NLGA on the basis of any claim from which I have released them herein. · Registration: $50 for recreational classes and $75 for competition team is due before you start class. This is required to reserve a space in a desired class. · No reservations will be made without payment or a completed registration form. · We reserve the right to cancel or combine classes if a minimum enrollment is not met. · We do not require you to sign a contract. However, we do have a withdrawal policy that you are required to fill out 30 days in advance of withdrawing a student. The withdrawal form must be filled out and signed in the office. Text, emails, messenger messages are not accepted forms of notice. **You will be responsible for all tuition for the upcoming month if a 30-day WRITTEN notice is not given! The withdrawal form must be submitted by the 1st of the month to avoid being charged for the next month. Any withdrawal notice given after the 1st of the month the following months tuition is due. Once your child is dropped from a class, we may fill that space with another child. We CANNOT hold a space for your child without payment. If the 30-day written notice is not given, you will be responsible for that month and the following month's tuition. 1. Our Discount Policy: Families registering more than one child or for more than one class will receive a discount. 3. Outstanding Balances: They are subject to Attorney Fees and Court Cost. 4. Return Bank Fees: There is a $35.00 returned check bank fee, and any declined credit cards will be subject to a $15.00 bank fee. any claim from which I have released them herein. I have had sufficient opportunity to read this entire document. I have read and understood it, and I agree to be bound by its terms. 6. Injuries: For injuries we will place a one month hold on your account with a doctor's note, no refunds will be given. PLEASE REMEMBER THAT WE WILL REQUIRE A 30-day WRITTEN NOTICE OF WITHDRAWAL TO THE OFFICE (NOT THE INSTRUCTOR) IS REQUIRED 30 DAYS IN ADVANCE OF WITHDRAWING A STUDENT FROM THE PROGRAM. Your child is entitled to ONE free make up lesson per month which is held on Friday & Saturday per month! (used within 30 days from missed class). •	If a student is absent due to illness, a death in the family or family emergency, then the missed class may be made up by attending the scheduled make up class of the same age and same skill level. •	You must currently be enrolled in the program in order to do a make-up. •	Once scheduled, all make-ups are counted unless cancelled prior to make up day. •	Adjustments in payment due to absences are not permitted. •	The make-up class MUST be scheduled though the office. •	Make-up scheduling is the responsibility of the individual student and parent. NLGA does not allow make ups due to bad weather. •	All make-up lessons are forfeited if your child drops from our program. Recreational Membership fees: In order to participate in classes at NLGA gymnast must be registered members of NLGA. All members are required to pay an annual fee of $50.00 per child. This fee is nonrefundable and nontransferable. We require the Registration fee as well as the 1st months tuition to be paid at the time of enrollment. Recreational Classes: Our Recreation program is a year around program, based on 50 weeks a year. Gymnast progress faster and do better when they participate year round. Tuition Fees: All members must have a credit card on file for automatic payments. Tuition is paid on the 1st of every month. Any payments made by cash or check after the 5th of the month will be charged a $15.00 late fee. If for any reason the credit card is declined or payment is not made by the 15th of the month the student will be dropped from the program and will be placed on a waiting list for their class if applicable. Refunds: There will be no refunds given. For injuries we will place a one month hold on your account with a doctor's note. Dropping Classes: WE REQUIRE A 30 DAY WRITTEN NOTICE FOR WITHDRAWAL FROM OUR PROGRAMS!!! You will be responsible for all tuition for the upcoming month if a 30 day notice is not given! Once your child is dropped from a class we may fill that space with another child. We CANNOT hold a space for your child without payment. Missed Classes: Recreational Classes are charged at an annual rate based off 50 weeks out of the year and broken down into monthly payments for your convenience. We do not charge extra for months with more than four classes, nor do we prorate tuition for months with less than four classes due to scheduled closings. In the event NLGA must cancel a class due to weather or a scheduled holiday we will offer a scheduled make up day and notify the participants via email of the day and time of the makeup class. Make-Up Classes: Please make every effort to bring your child to their scheduled class! If your child must miss due to illness or injury, we will allow a MAXIMUM of one make up class per month. This class must be made up within one month of missing the class. This is in order to keep the integrity of our program and keep our student-teacher ratio. THERE WILL BE NO REFUNDS OR PRORATION FOR MISSED CLASSES. Make up classes must be scheduled at the front desk and we do not guarantee availability for the same level class for the makeup. By entering your credit card information below, You are giving Next Level Gymnastics Academy the authorization to draft this account on the first of each month.